One of the all-time best inventions of the human mind, in my humble opinion, is the map. Whether ink to paper or pixels to screen, maps represent reality as seen from the cartographer’s point of view. Beyond the accurate recording of topography and societal infrastructure, map makers convey all sorts of information, depending on who has paid their salary! Display all the gas wells in Allegany County! List all the businesses of the Whitesville! Differentiate between a dirt road, a tiny local road and the main state road. One of my favorite sites lets me explore the world according to my ancestors. 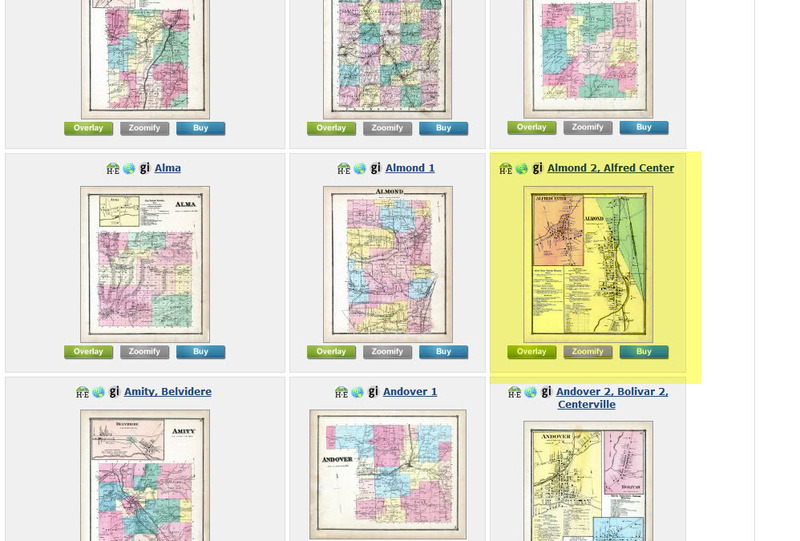 Historic Map Works lets you browse United States, World or Antiquarian maps by searching with a Keyword, Family Name or Address. 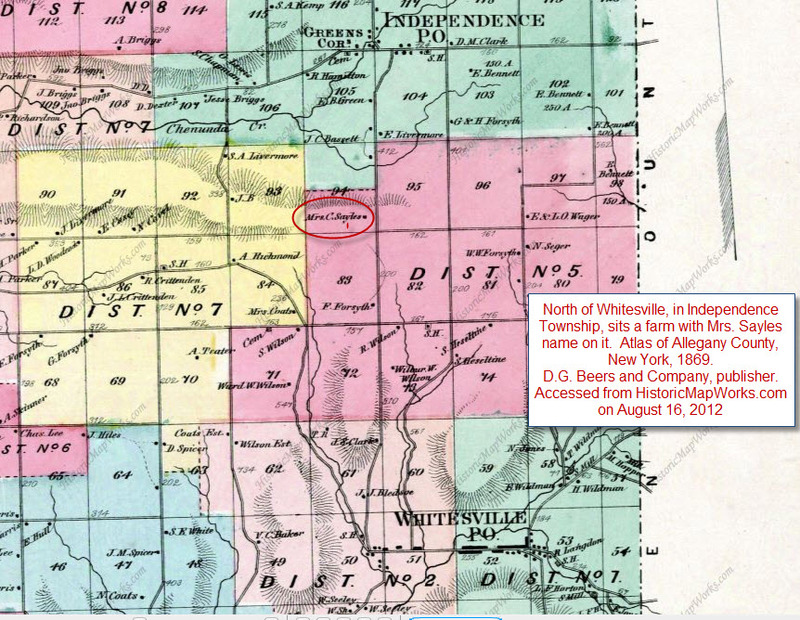 I wanted to know what a map could tell me about my ancestors, Ira and Serena Sayles, in the 1860s when I know they lived in three separate towns in south central New York. Using the keywords ALLEGANY COUNTY NEW YORK my query returned a treasure: The Atlas of Allegany County, published by D. G. Beers and Company in 1869. Each page of the atlas has been digitised, and can be opened for expanded viewing. 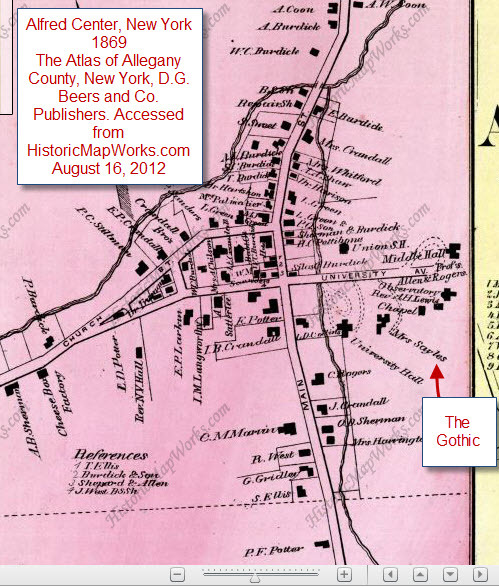 This page of Alfred Center shows my great-great-grandmother’s home, The Gothic. According to records this house was sold and the proceeds used to purchase a farm in Mecklenburg County, Virginia, shortly after the publication of this atlas. Interestingly, I also found Serena Sayle’s name on a property in the township of Independence and her husband’s name, Ira, on a property in Rushford, where he was the principal of Rushford Academy. With a subscription to Historic Map Works I can download and print these maps out, further exploring Ira and Serena’s world; who did they live next to, what stores might they have shopped in, how far did they travel in going about their daily lives? All these details, from a map. Next Article Remembering 9/11: We are all together. Still. Lansing, Lansing, Lansing….hmmm. Nope, can’t come up with a single thread for you to follow, but I really appreciate your offer. Sounds like you have a story behind your details, and I look forward to hearing more! Thanks for reading my map story!